Next to my profession of faith in Christ, no decision has so changed my life than when I forgave my dad. My younger sisters and I grew up in an extremely violent alcoholic home. We saw and experienced things I’d prefer not to share here. When sober, my dad was amazing. But, when he was drunk he became a monster. And he was drunk a lot. Over time – especially into my adult years – i developed a seething hatred for my dad for what he had done to my mom, and to my sisters and myself. That part of my life – those memories – had drifted into the shadow. But, in 1997 – after my youngest sister overdosed on heroin – I unraveled. I was 34 years old. Having been forced to get counseling (I thought counseling was for wimps), I quickly discovered what hate for my dad had done to my life. Eventually, in a moment I can remember as though it was yesterday,…. I forgave my dad. Completely. I learned that forgiveness wasn’t about changing my dad – it was about changing me. A little over a year later, on 11/22/98, I had the joy of sharing this with my dad. 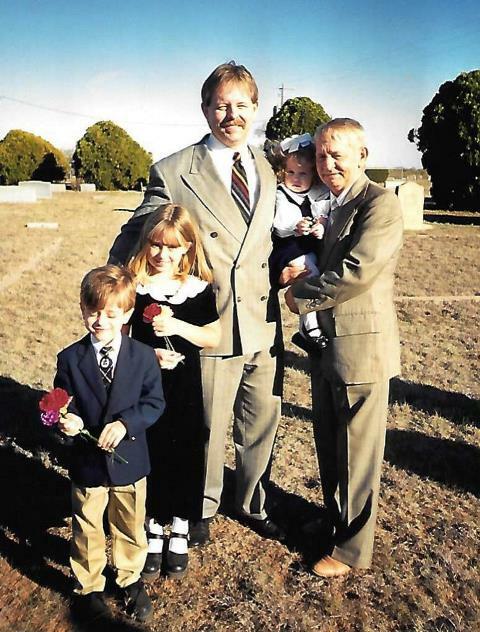 The photo here is significant not only because of the grace and forgiveness it represents – but for the fact that this was the first time my dad had ever seen my children. My dad died of alcoholism two years later, 11/10/2000. He was 57. One day, because of the Cross and the Empty Tomb, I’ll see my dad and son again – completely whole. No more alcoholism. No more depression.